A huge earnings beat sent the regional airline company's shares to a new multi-year high. What: By and large, airline stocks had a terrible April. But one oft-overlooked airline escaped the carnage. In fact, shares of top regional airline company SkyWest (NASDAQ:SKYW) soared 17.6% during the month, according to data provided by S&P Global Market Intelligence. So what: Nearly all of SkyWest's gains last month came on April 29, the day after the company issued its Q1 earnings report. That's what happens when you blow away all expectations. In Q1, SkyWest posted earnings per share of $0.52, doubling up the average analyst estimate of $0.25. That was nearly triple its EPS of $0.18 from Q1 2015. SkyWest's earnings have been on a strong upward trajectory for more than a year now. In 2015, EPS rebounded to $1.98 from just $0.14 a year earlier. SkyWest has benefited lately from its position as one of the only regional airlines with enough pilots to take on new business. That doesn't mean it's growing. Instead, SkyWest has been able to add new, high-margin flying contracts as unprofitable (or marginally profitable) contracts to fly older 50-seat jets have expired. This has led to huge earnings growth despite stagnant to declining revenue. SkyWest has also significantly improved its operational performance relative to two years ago. This has allowed it to earn larger performance bonuses from its mainline airline partners. Now what: SkyWest's earnings will likely remain on an upward trajectory throughout 2016 and 2017, as it adds dozens of new, highly desirable E175 regional jets to its fleet. The risk for investors is that the regional airline pilot shortage will hit home a few years later, as SkyWest will eventually run out of low-margin contracts to wind down. At that point, it could be forced to significantly increase pilot pay or drop profitable contracts in order to match its flying commitments with the supply of pilots. With this ever-looming threat of future margin pressure, investors shouldn't get too excited about the strong earnings trajectory at SkyWest today. 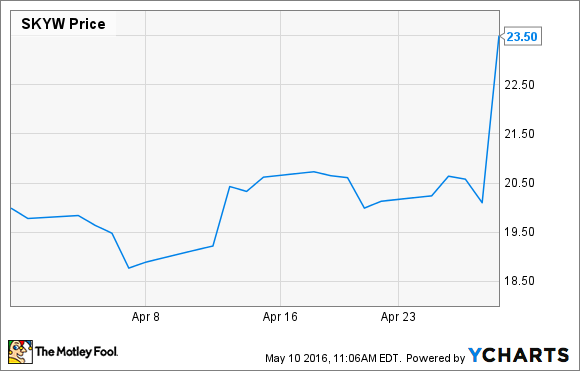 Can SkyWest Sustain Its Earnings Momentum?